Rock salt is the most widely used de-icing agent in the United States because of its cost and effectiveness. With favorable temperatures (above about 25 degrees), salt can melt several inches of snow and will prevent or reduce the bonding of compacted snow to pavement surface. Salt truck drivers are usually able to complete their routes in a minimum of 4 1/2 hours. Plowing starts once the snow reaches a depth of three inches. Once plows are attached to the trucks the time needed to complete a route almost doubles. Who makes the call to salt the streets? The Road Superintendent and his Assistants are constantly monitoring road conditions on a continuing basis during the snow season. The Township Police Department will also monitor the road conditions, notifying the Road Superintendent and/or his Assistants when snow begins to accumulate on the pavement surface and/or the road conditions become hazardous for motorists. The Road Superintendent and/or his Assistants determine the call-out needs by checking radar images and the latest weather forecast. Boardman Township Road Department utilizes a “DTN” Satellite Dish to get weather updates as quickly as possible. This is one of the reasons that such a rapid response is achieved. 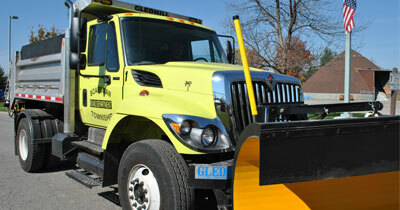 Most times, salt trucks are on the road within 30 minutes of call-out. 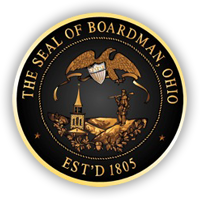 The general rule is, subdivision streets are under the jurisdiction of Boardman Township ( 330-726-4190 ). The Mahoning County Engineer ( 330-799-1581 ) maintains collector streets such as East Parkside Drive, Glenwood Avenue, Hitchcock Road, Hopkins Road, Indianola Road, Lake Park Road, Lockwood Blvd., Mathews Road, McClurg Road, Meadowbrook, Mill Creek Drive, Newport Square, Schenley Avenue, Sheban Drive, Shields Road, Simon Road, South Avenue, Southern Blvd., Tippecanoe Road, Truesdale Road, Walker Mill Road, West Blvd., Western Reserve Road. The Ohio Department of Transportation ( ODOT –330-533-4351 ) is responsible for the maintenance of roads such as State Route 7 ( Market St ), Rt. 224, Arden Blvd., Lockwood Blvd., Midlothian Blvd., Interstate 680. When it starts to snow, please park your vehicle off the street. This will prevent your vehicle from being splashed by salt spray or being plowed in. A snowplow needs a minimum roadway clearance of 15 feet to maneuver safely, and on some streets a snowplow cannot proceed when vehicles are parked on both sides of the street. This is the responsibility of the resident; the township cannot provide this service. The plow operators do not have control over the snow coming off the edge of the snowplow blade. To avoid the frustrating problem of the snowplow covering the end of your driveway with snow after you’ve just shoveled it, stand facing the street and shovel your snow into the yard, instead of the street.